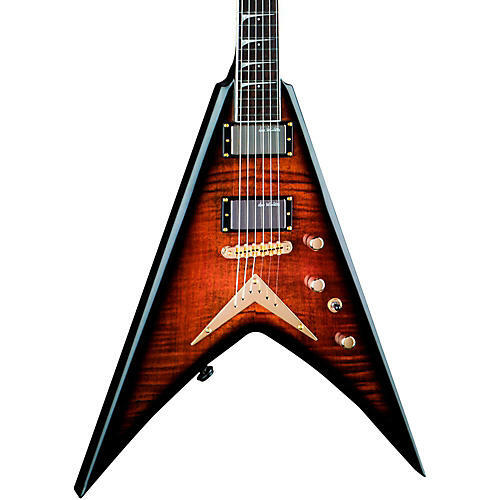 The Dean V Dave Mustaine Electric Guitar is destined to belong to only a few fortunate players. It possesses a checklist of Dave's favorite features at an affordable price. In particular, the D-shaped mahogany neck is made exactly to Dave's specs, which he considers to be one of the fastest he's ever played. Active Seymour Duncan pickups provide that essential Mustaine tone with the same controls that Dave uses to dial in his sound. The body comes in a limited choice of finishes and is perfectly balanced for playing comfort. Includes case.